THIS IS THE LARGEST LOSS THAT SRI LANKA HAS EVER SUFFERED. 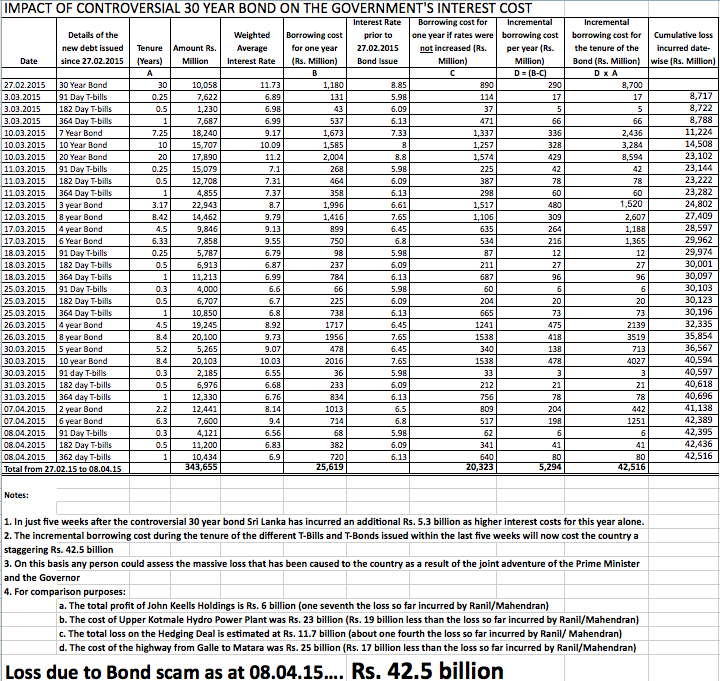 Attached herewith is an expert computation of the increase in interest costs that has been suffered by the Government as a result of the 30 year bond interest rate being artificially increased on 27th of February 2015. This massive loss as pointed out by Hon Bandula Gunawardena is increasing every time Treasury Bills and Bonds are issued from 27th February 2015 onwards. It has already reached mega proportions as shown by him, and is easily the single biggest loss that the Sri Lankan Government has ever suffered IN IT'S ENTIRE HISTORY. What is worse is that it is continuing and the losses are mounting every week. Therefore, this bleeding MUST BE STOPPED immediately if the economy is to be safeguarded. Unfortunately, the government as well as most people are in a state of denial with regard to these losses, and that is what is so sad. In the meantime, the interest rates are now artificially high as a result of the bond fiasco, and the government as well as all the people are now paying those unnecessarily high rates. The benefit of the low inflation regime is being squandered.